Good afternoon! It gives me great pleasure to meet and address such a distinguished assembly of experts and officials. May I, on behalf of the Government of the Hong Kong Special Administrative Region (SAR) of the People's Republic of China, extend to all of you our warmest welcome. May I also express our gratitude and congratulations to both the Asian Academy of International Law and the Chinese Society of International Law for organising this Colloquium, which provides a valuable platform for exchange of ideas among judges, officials, experts and legal practitioners from around the world on topical issues of international law. These topics include "One Country, Two Systems and Interaction with International Law", which is a pertinent subject for us as the principle of "one country, two systems" is the most important policy contributing to our success since the establishment of the Hong Kong SAR 20 years ago. Capitalising on our unique advantages under the principle, we have thrived as a vibrant international metropolitan city. With the authorisation by the Central People's Government for Hong Kong to conduct our external affairs, we have consolidated and expanded our vast connections with countries and regions around the globe and across different fields, including trade, investment, finance, aviation, culture, and legal co-operation. We have established ourselves as the freest and most competitive economy, as recently evaluated by the IMD's World Competitiveness Yearbook 2017 and the Fraser Institute's Economic Freedom of the World Report 2016. Hong Kong's success can also be attributed to our upholding of the rule of law. We have long enjoyed a very high reputation internationally in the rule of law and in the international legal and dispute resolution services. These achievements are evidenced not only by Hong Kong's various high global rankings in the rule of law, judicial independence, and settlement of disputes including international commercial arbitration, but also by the fact that Hong Kong has attracted, and continues to attract, prominent international organisations and international arbitral institutions to set up their offices in Hong Kong. For instance, renowned international arbitral institutions such as the International Court of Arbitration of the International Chamber of Commerce, the Permanent Court of Arbitration, the China International Economic and Trade Arbitration Commission and the China Maritime Arbitration Commission have established their presence here or chosen to conduct arbitral hearings in Hong Kong. Building on such achievements, we are actively participating in the Belt and Road initiative, which has drawn wide attention and gained positive response from the international community since it was raised by President Xi Jinping in 2013. Indeed, in the keynote speech of Chairman Zhang Dejiang of the Standing Committee of the National People's Congress of China at the Belt and Road Summit held in Hong Kong last May, he referred to Hong Kong as a key link for the Belt and Road, and that the Central Government has made it a major policy to support Hong Kong's participation in the Belt and Road development. He also mentioned a number of unique advantages enjoyed by Hong Kong, including our professional services in the legal field. He further pledged the Central Government's support to Hong Kong's efforts in building a centre for international legal and dispute resolution services in the Asia-Pacific region, so as to provide legal and arbitration services to the countries along the Belt and Road. To take full advantage of the Belt and Road opportunities, the Hong Kong SAR Government has been building up support for companies and professionals. In this respect, promotion of greater awareness and appreciation of international law is an important step for our legal profession to be better equipped with the requisite knowledge and skills for handling complex legal issues in the context of Belt and Road. 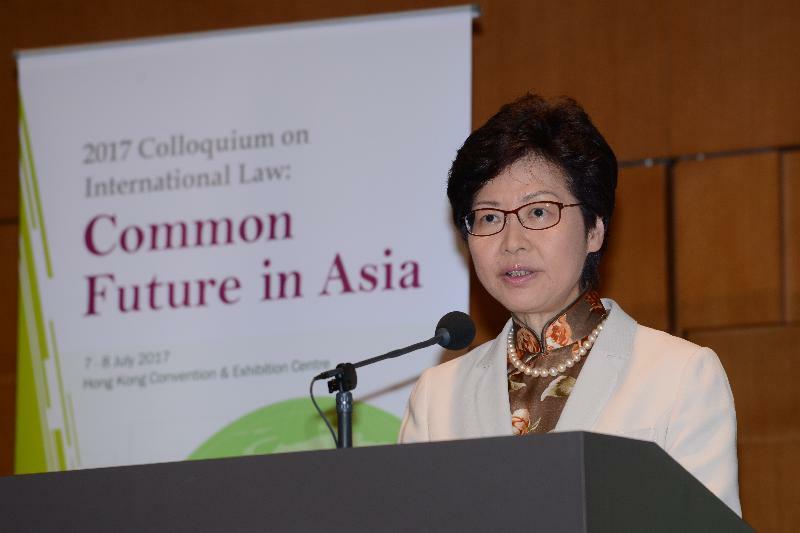 Hence, we are most grateful to AAIL and CSIL, as well as Ms Teresa Cheng, SC, and Mr Li Shishi, for the successful organisation of this distinguished Colloquium in Hong Kong, and to all its eminent participants for coming to share their valuable insights on pertinent questions of international law. On this note, may I wish the Colloquium every success, and those of you visiting Hong Kong an enjoyable and memorable stay.